This week Sony announced the price and release date for its feted virtual reality peripheral. PlayStation VR. The new device, requiring PlayStation Camera, will cost £349.99 in the UK and is launched, ahead of the holiday season, this October. A launch lineup of over 50 games, including Eve: Valkyrie, PlayStation VR Worlds, Tumble VR and Until Dawn: Rush of Blood, is promised. 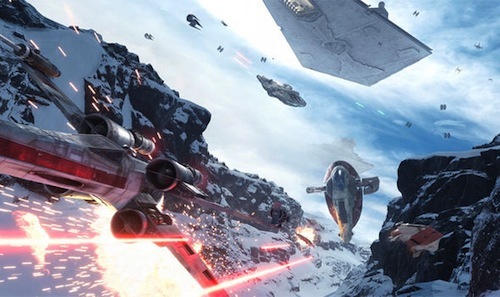 But, Star Wars fans will be much more excited to learn EA and developers DICE have announced a PlayStation exclusive virtual reality version of Star Wars Battlefront for PS4. From the official Star Wars site: "This will be a Star Wars Battlefront gaming experience like nothing else… coming only to PlayStation VR, where players can finally fully immerse themselves in a galaxy far, far away. There will be more news about this in the months ahead." Suffice to say it's piqued my interest enough to place a tentative day-one pre-order. It's worth noting PlayStation VR will cost around £700 from scratch. This includes PS4, PlayStation Camera and Move controllers. The DS4 is compatible, but Move may experience its first renaissance since Heavy Rain. Excited for PlayStation VR and what titles (if any) would you like to see supported? Let me know in the comments below.